For the quintessential Key West experience, visit Mallory Square in the historic Old Town, adjacent to the cruise ship port. This outdoor plaza overlooking the Gulf of Mexico attracts tourists, locals, and people from near and far for the Sunset Celebration. Catch street performers, musicians, sword swallowers, dancers, and all types of colorful entertainers before witnessing one of the world's most magical, picture-perfect sunsets at this nightly event. The festivities begin about two hours before the sun goes down, which gives you plenty of time to take in the amusement of the performers, crafts on display, food carts, and enjoy the bars and restaurants surrounding the square. Bring your camera because you could be lucky enough to see the famous Green Flash which occurs when the sun sinks below the horizon. No cost to enter, prices vary per establishment. Open daily from 7 am to 12 am. Where can I park near Mallory Square? You may park your car at the Southwinds Motel and walk to Mallory Square and other area attractions, however, if you prefer to drive and park by the famous plaza, the Mallory Square Parking Lot is directly in front of Key West City Hall at 400 Wall Street. Fees are $4/hour or $32/day. All Key West City parking lots have pay stations that take credit cards or coins. There are also privately-owned lots all around the island. Where can I eat near Mallory Square? 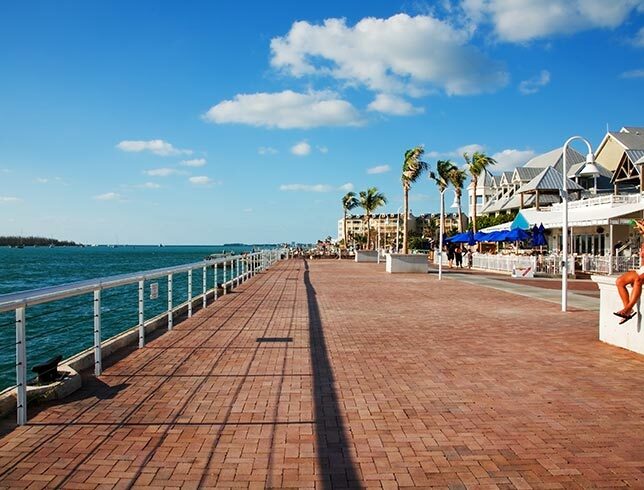 There are plenty of delicious restaurants and bars in and around Mallory Square. From seafood spots to Cuban eateries, feast on whatever your hearts content whether its raw oysters off the shell or a Mexican fiesta. Some local favorites include El Meson de Pepe, Fisherman’s Café, Smokin’ Tuna Saloon, Rooftop Café, and the famous Hog’s Breath Saloon, just to name a few. There are also food carts sprinkled around the square for quick snacks and treats.